1175–1225; (adj.) Middle English < Old French < Late Latinsimplus simple, Latin (in simpla pecunia simple fee or sum), equivalent to sim- one ( see simplex) + -plus, as in duplus duple,double ( see -fold); cognate with Greek háplos ( see haplo-);(noun) Middle English: commoner, derivative of the adj. i’ve colored the meanings within the origins that i think of when i hear the word “simple”. the notion of something being just what something is – not more, not less – basic, pure, uncomplicated, simple. recently there was a celebration. the world gave me a gift – the ability to see and appreciate simple joys – at least for the day. i hope to keep this vision, as it tends to fade, hide, and be taken for granted. our newest addition, sugar bear, and our full of love cat, yem, touched noses. this event was free of hissing and swatting. want more details? . 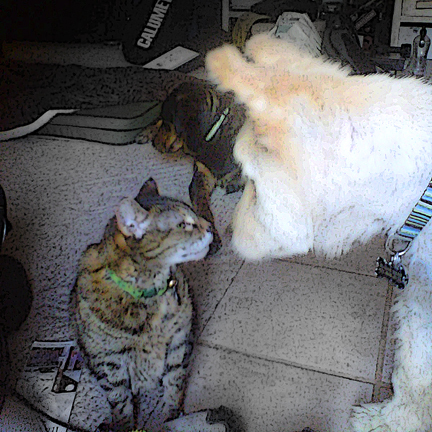 . .
when we adopted our first dog, jackson, one of our cats, yem, accepted him fairly quickly. i still hope to see them laying together one day. for now, being within a paw’s reach and still being content is a nice contrast to hissing (and swatting). more recently sugar bear became part of our family. as her eyes allow her less than perfect vision, she often gets close to one of the kitties before she knows they are there. this means gato, the less tolerant, hisses and swats. up until yesterday yem too would hiss & sometimes swat (though her swats are more like a tap). 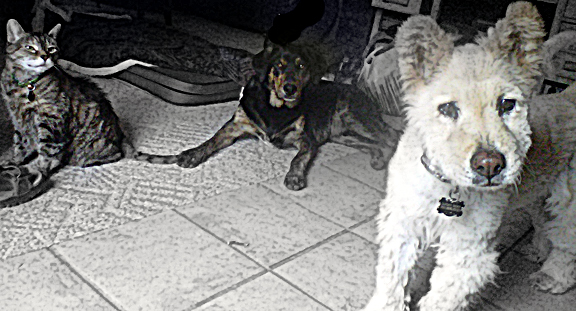 i was on the phone and i see yem & sugar bear slowly inching their noses closer & closer. turn around & walk away. excuse the quality -they are phone photos & i tried my best to edit them so you could see all 3.
the first time i attempted to make this “onion bread” i waited too long and some of the onions had gone bad. it tasted less than par. this time i wrote it on my calendar, only a few days after buying the onions, and plenty of time to make it, feeling unrushed. it’s still in the dehydrator. i’ve been picking off pieces to taste if it’s been done. it definitely tastes %100 better. track work, also known as speedwork, is one of my biggest obstacles. it’s a struggle every time i do it. often i end up doing 1/2 or some other percentage of what is on the schedule that day. yesterday, with company, it was partially enjoyable. i even completed the full scheduled amount. what a difference company makes. it even renewed my overall joy of running again. after 2 rough runs this weekend i was struggling with motivation, wondering why i push myself to do things if my heart is elsewhere. well, sometimes, it will be rough. at the same time, the next day could be wonderful. i hope to remember this. how can we truly ever say “thank you”. when it is said and meant, i hope this is seen. for my saturday run i decided to participate in a local run (black canyon ascent). this is 6 miles of uphill. along the way i realized i was underprepared and running low on energy. a man pushing a 3 wheel sport stroller caught up. i asked if he had any food. yes. he handed me a portable applesauce (yay) free of any sort of hesitation. i thanked him profusely and said he saved me. 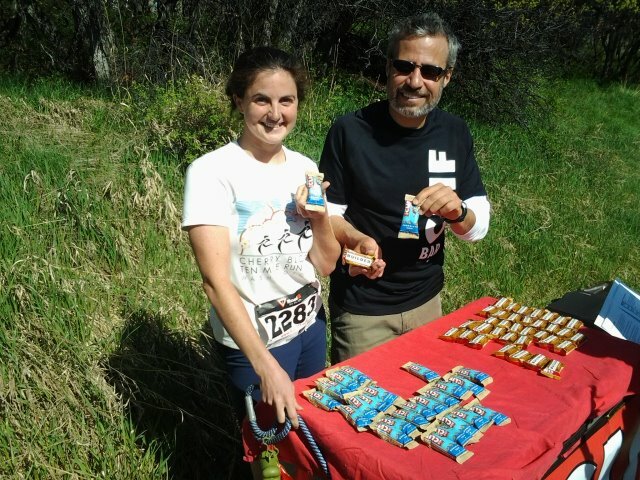 at the end there was a man at the cliff bar table – cliff bar was a sponsor for the event. he found out who i was and mentioned he had donated last year because he believed in my cause (race the states for First Descents). i thanked him, saying every bit of support got me through the year. i appreciated the opportunity to say thanks in person. he asked to get a photo with me. i feel undeserving of the attention. part of me wishes i could have done the project without showing my face. i find my mind wanders much more than when i was younger. during a conversation i am distracted enough by my own thoughts let alone all the gadgets, toys, what have you. – focus my thoughts on the conversation, the words, feelings, emotions, needs, desires of the person(s) in the conversation vs ways to “fix” the situation, or a similar experience i may have been through (unless asked). 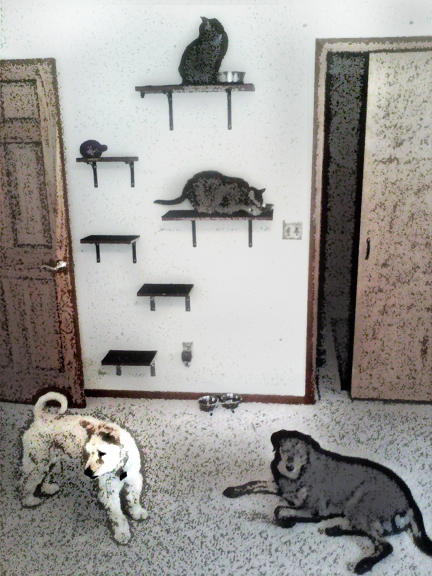 our kitties enjoying their new shelves. they can eat in peace whenever they like.